There are unlimited possibilities for small businesses you can start! So, how do you choose? It’s something that requires careful consideration, after all—this is a big deal. I think this step is critical to the eventual success of your business. If you choose a business based solely on the financial aspects, it can drain you and leave you just as miserable as any job you hate. Many people never consider their own personal interests, values, goals and dreams when it comes to business. Big mistake! Your business is personal and the better you can align it with your personal passions, abilities and goals, the more success you will experience. There is one school of thought that says that you shouldn’t be too passionate about your business. The feeling there is that you will be too “involved” with the product or service to properly execute the business aspects of your “passion”. And, perhaps that is a possibility. Many people are very talented and yet unsuccessful because they are not able to apply business principles to their talent in order to make money. There are many flat-broke geniuses out there. If you are overly concerned about the “artistic” side of your business, you either need a business-minded person to be your partner or you need to develop business skills yourself. Alternately, love your art and choose a business in another area of interest to run. Motivators: Take a blank piece of paper and list as many things as you can think of –brainstorm and don’t censor yourself. There are only great ideas at this point. What do you like? Think of activities, events, places, people, ideas, values, dreams, anything at all that gets you to generating ideas. Write down at least 20. This should take under an hour. Skills/Qualities: Then, survey your friends & family and ask them what you are really good at. Write those answers down, too. If you already know what you are good at, make your own list. However, it is great fun to see what others think, so ask! Use as much paper as you need! Then, take a few days to let the lists rest. After a day or two, take out the list you made and circle the top 5 motivators –the five that you love the most. Take out your survey and circle the top 3 skills/qualities. Take another blank piece of paper and make two columns. In column one, list the top five ideas you generated. In column two, list the top 3 things you are good at. There are quite a few business possibilities from this group of motivators and skills/qualities: tour group leader, event planner, public relations professional, music manager, media ad sales, travel agent, travel sales, music sales, travel writer, reporter, caterer, disc jockey, trade show organizer, and campaign manager. You could also try one of the many career/interest inventories available online that can help you with finding suitable areas of interest. The way you go about finding a job you would love is the same way you choose a business—based on your personal abilities and interests. You might also try working with a personal coach. He or she can help you—both in determining your passions and in creating a plan for realizing your dreams. 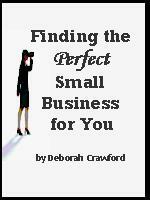 This ebook has great information for choosing a business you'll love. If you are looking for a quick how-to guide for determining what small business would work for you, this ebook is for you. Includes 25 ideas for easy-to-start businesses that you can have up and running in no time. Plus, valuable information to help you avoid scams that take your money and leave you high-and-dry. You'll also find a beginner’s guide to networking. It’s one of the best marketing techniques available for small and home-based businesses. --great tips that will help you stay energized and focused on your success. --information on setting up your business. A quick read that will have you excited and ready to get the ball rolling on your very own small or home-based business. You can download it immediatly, and it's a great bargain at only $2.95.